35m², 2 bedrooms, well equipped, well appointed, comfortable, terrace with garden furniture and sea view. Located on a 16-hectare natural site in Belle Ile en Mer, the VVF Villages Belle Ile en Mer - Le Palais *** comprises 40 pavilions of 2 adjoining residences, most of which have a terrace offering a breathtaking view of the sea. ocean. 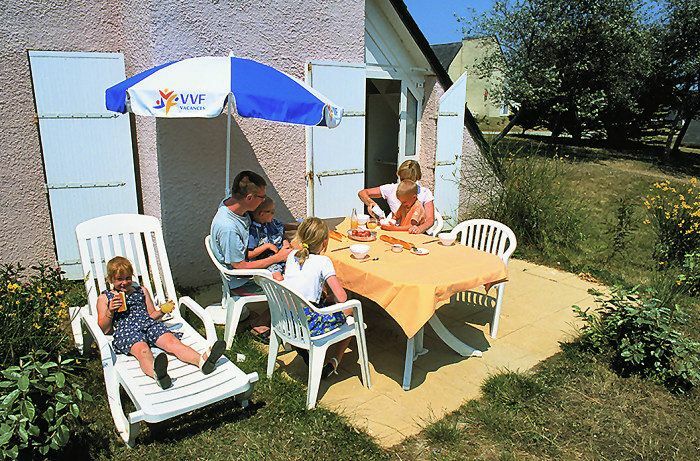 A holiday village enjoying an exceptional location by the sea to discover one of the wonders of the Gulf of Morbihan. The property has many leisure facilities for the whole family. Inside, a reading corner, a TV room and a play area with table tennis and table football, and outside, a playground for children and sports fields (volleyball, basketball and petanque) . The village also offers a bike rental service * at low prices, allowing you to long hikes and walks in the area enjoying the bike trails from the village. An animation program will also be proposed and will punctuate your stay, with a choice of several daily activities focused on discovery, sports tournaments and nn.& nbsp; In the evening, you will find the animation team of the village to spend convivial and warm evenings around shows, games-aperos and other animations. For your comfort, your village club offers various services such as towels * and bed linen, household packages * or baby kits (folding bed, high chair, baby bath). It also has a launderette * (with washing machines and tumble dryers), free Wi-Fi access in public areas and free parking. You will be charmed by the beauty of this island of contrast and light with its rocks with strange shapes, as well as its beaches and its waters of an amazing blue-green. The diversity of landscapes will surprise you at the turn of a coastal path or a small road that meanders on the island. Without a car, on the spot all is planned: the bus of the island, the delivery services to the village and the hirings of bike are available to accompany you on the marked trails and ballads of all kinds. Apartment 3 rooms of 35m² for 6 persons including a living room, a bedroom with a double bed in the loft and a bedroom with 2x2 bunk beds, kitchenette, bathroom, separate WC and terrace with sea view. Apartment with a kitchenette with a mini oven and cooking utensils, bathroom with sink and shower, terrace with garden furniture. TGV Gare d'Auray or Quiberon (30 km). Crossing via C. M.N. reservation at 0820056000. Warning reservation strongly recommended for vehicles and passengers in peak times.